This dresser has cottage style and caring for your clothes on its mind. Its drawers are ready, with soft self-closing drawer guides, to hold your bulkier clothing items, and its top three drawers are the perfect size for organizing smaller items. 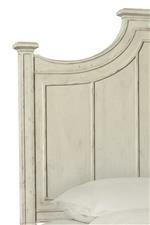 Matching the worn pewter drawer pulls, and providing a slight two-tone look, is the warm gray distressed finish on the top of the dresser. There is also a stone top option for this item. The Bella Cottage 9 Drawer Dresser with Weathered Finish by Bassett at AHFA in the area. Product availability may vary. Contact us for the most current availability on this product.